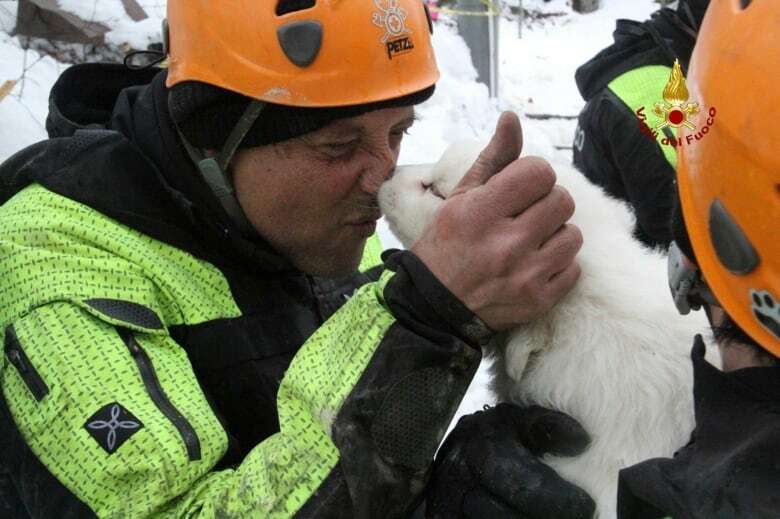 Italian emergency crews pulled three wiggling, white sheepdog puppies out from under tons of snow and rubble at an avalanche-struck hotel on Monday, giving rescuers lifting spirits even as the search for 22 people still missing five days after the disaster. One more body was located, raising the death toll to seven, and the first human survivors of the deadly avalanche were released from the hospital. Questions intensified, however, into whether Italian authorities underestimated the risks facing the snowbound resort in the hours before the deadly avalanche. The discovery of the three Abruzzo sheepdog puppies raised everyone's spirits. Jubilant emergency crews carried the pups out in their arms, with one firefighter burying his face in the fluffy white fur to give the dog a kiss. The puppies were born last month to the hotel's resident sheepdogs, Nuvola and Lupo, and were prominently featured on the hotel's Facebook page. Their parents had found their own way out after the Wednesday afternoon avalanche. 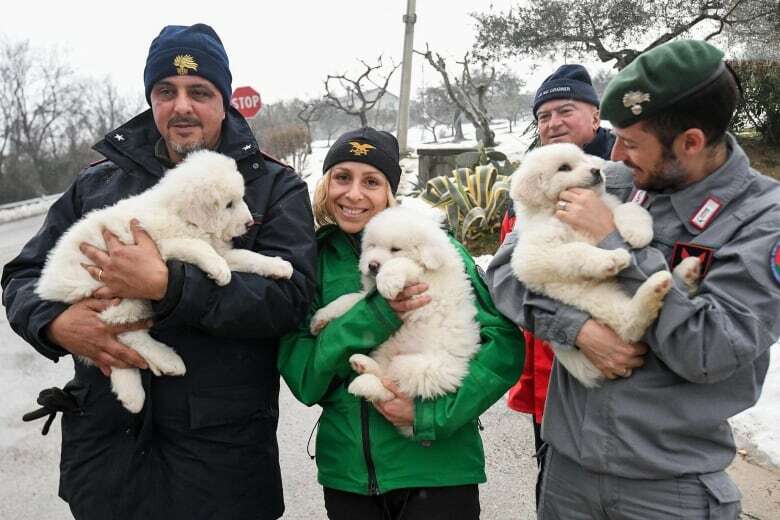 Firefighter spokesman Fabio German said the three puppies showed that conditions under the snow could still support life. Emergency crews have been hoping that the missing people may have found air pockets under the debris, and that the snow had insulated them from the frigid temperatures. 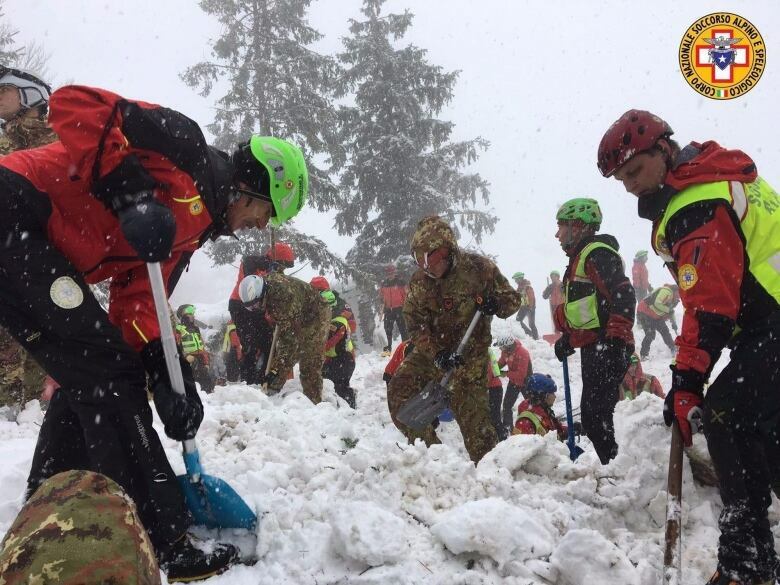 So far nine people have been rescued from the Hotel Rigopiano and six people have died. The first survivors were released Monday from a hospital in the nearby city of Pescara, including Giorgia Galassi and her boyfriend, Vincenzo Forti. "Thank you, thank you everyone!" Galassi said as she waved from the front door of her parents' home in Giulianova, on the Adriatic coast. Flanked by her parents, she said she felt fine. Hotel guests Giampiero Parete, his wife and two children were also home. It was Parete who had first sounded the alarm after he by chance left the hotel to go to his car moments before the avalanche hit. More than two days have passed since anyone has been pulled out alive from the hotel, and rescue crews were still trying to recover the body of the sixth known victim from the rubble. Conditions at the site were deteriorating, with the metres of heavy snow turning to ice. Meanwhile, the investigation intensified into whether local government officials underestimated the threat facing the hotel, which was already covered with two metres of snow, had no phone service and had dwindling gas supplies when a series of earthquakes rocked central Italy on the morning of Jan. 18. Italian newspapers on Monday reproduced what they said was an email sent by the hotel owner to local and provincial authorities that afternoon asking for help because "the situation has become worrisome." "The hotel guests are terrorized by the earthquakes and have decided to stay out in the open," Bruno Di Tommaso wrote. "We've tried to do everything to keep them calm, but since they can't leave due to the blocked roads, they're prepared to spend the night in their cars." Already, the Pescara prefect's office has faced criticism after a local restaurant owner said his calls reporting the avalanche were ignored. Quintino Marcella said he called the office after receiving word from one of his chefs who was vacationing at the Hotel Rigopiano and escaped the avalanche by chance. The ANSA news agency reported Monday that the prefect's office had called Di Tommaso after receiving the avalanche alarm, but that the hotel owner — who was in coastal Pescara at the time, not in the hotel — hadn't heard anything himself, possibly leading officials to underestimate Marcella's report. The president of the province, Antonio Di Marco, has confirmed he saw an email from Di Tommaso and had arranged for a snowplow to clear the road that night, the ANSA news agency reported. The avalanche, however, hit sometime before 5:40 p.m., when Marcella received the call from his chef. One aspect of the criminal investigation into the disaster involves discovering where the province's snowplows were being used, news reports said.